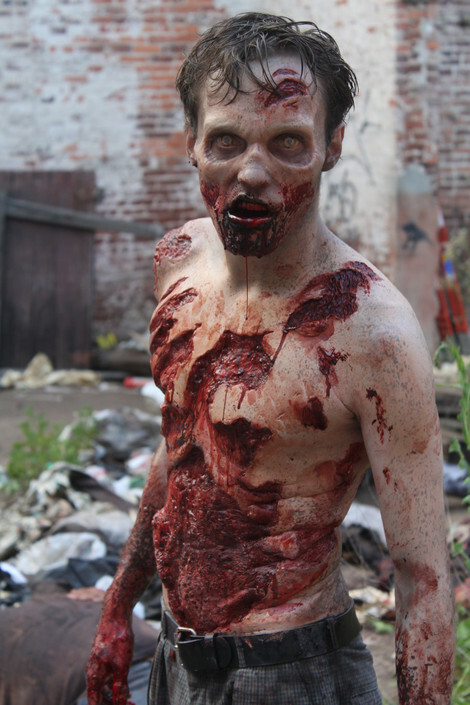 American zombie movies and TV shows have replaced the Western as the go-to genre for exploring our culture through film. Classic Westerns address issues of American identity, racism, loyalty, friendship, moral obligation and ambiguity, and alienation by placing its characters in lawless environments that require them to make choices without a defined societal structure for guidance. Hot damn! I should totally write articles for Film Comment, no? I just made that up off the top of my head. Anyway, remove the phrase “Classic Westerns” from the beginning of that long, indulgent sentence above, and replace it with “American zombie movies” and it still holds true. I believe that explains the continuing popularity of zombie stories, and why people keep writing them. After all, good fiction writers strive to create worlds that explore those topics with subtlety and nuance and that force characters to make moral choices… even ones with potentially tragic downsides. That’s why The Walking Dead so compels us to watch. Sure, everyone loves to see entrails ripped out and zombie heads cleaved with machetes. But gratuitous violence without characters or a story doesn’t make us tune in week after week, shout at the TV, or discuss, discuss, discuss the next day at work. On TWD, as with other great Zombie stories like Night of the Living Dead, the zombies are there to scare and thrill, but they are mostly there as the impetus for human conflict. As writer Andi Marquette excellently discussed on her blog today, TWD’s characters can be both heroic and cruel, or brave and selfish, often at the same time. They have no congress to write laws or police to enforce them. Some turn to the Bible for guidance, others pretend the rules of civil society are still in effect, and still more take advantage of the freedom to act with legal impunity. The show asks us to consider which of these choices is best, and it asks us to imagine what “best” means. Does best mean taking whatever action is necessary to ensure the survival of you and your family? Or does it mean remaining loyal to your pre-apocalypse ideals, even if doing so results in your own physical destruction. 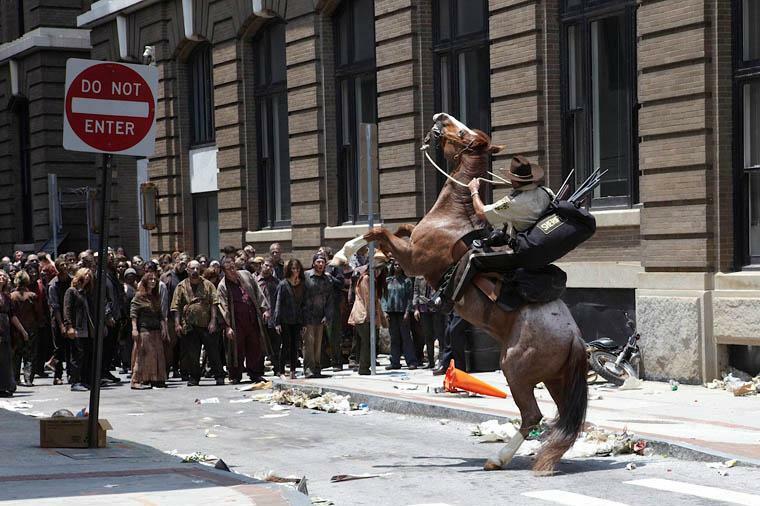 Hey, maybe The Walking Dead is a western after all. Sometimes I feel that TWD has a conservative bent. Shane, who espouses self-reliance and a well-armed (if small) populace, is often the one who saves the day in a crisis, while those who represent egalitarian ideals and gun control, such as Dale, are depicted as ineffectual and even dangerous in their passivity. On the other hand, Hershel’s adherence to biblical principles nearly gets everyone killed. And remember when Rick, the ostensible hero, stood before a statue of Christ in an abandoned church, asking for “a sign.” He was promptly attacked by a zombie. The overarching question of The Walking Dead is this: Is morality a universal ideal or a human construct? I prefer to avoid labeling my beliefs, because labels equate to ideology, and ideology has set a bad precedent in human history. That said, if you want to call me a secular humanist, I won’t argue. I believe nature is amoral. Stars explode, lions eat gazelles, babies are born with fatal diseases. Morality is simply necessary for society to function. I also happen to think morality, when wielded without judgment, is the greatest of all human constructs. Imagine the day when our testosterone-fed, caveman brains finally catch up with it. In The Walking Dead, the characters are asked to evolve a bit faster than they were expecting in that regard. Something tells me at least one zombie will be a head shorter by the end of tonight’s episode. This entry was posted on Sunday, October 14th, 2012 at 6:37 pm	and tagged with arts and entertainment, morality, The Walking Dead, Writing, zombies and posted in Movies and TV. You can follow any responses to this entry through the RSS 2.0 feed. Thanks for the shout-out! I like questions about morality, because in circumstances like a zombie apocalypse, say, what exactly ARE your moral ties to others? I lean toward morality as a social construct, because its mores are different culture to culture, historical context to historical context. Ideas about morality are a kind of glue that ostensibly are supposed to bind us into effective and organized communities. Well, what happens when those communities break down in a zombie apocalypse? Where do your loyalties lie and what exactly is the point of survival? Just watched the 3rd season premiere of Walking Dead [SPOILERS] and Rick has pretty much implemented a Ricktatorship. He talks about “making a life for ourselves.” Well, what kind of life will that be, and what exactly is the purpose of it? 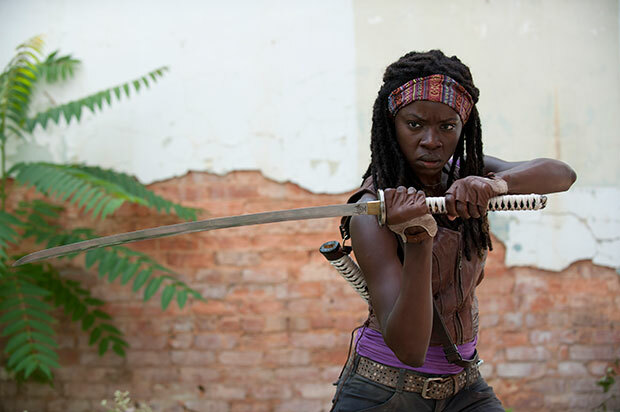 And a completely unrelated question: What is UP with Michonne’s zombies? What purpose do those two serve? Do they somehow help her move around among groups of walkers? Cuz that it some fascinating stuff there. It’ll be interesting to watch her character reveal itself. Great points, especially those about the cultural context of morality. It reminds me of a discussion I had about suicide: Why is a suicidal American considered mentally ill but a suicidal Japanese considered honorable? I’ve read that the other zombies can’t smell her with the two walkers nearby. I look forward to seeing what her character is all about as well. Sorry, my wordpress is acting funky tonight so I can’t fit the whole thing. Like everyone else, I’ve imagined myself in a zombie apocalypse, and I know I would be a lot like Rick, minus the speeches and the crazy. I am not the pack-it-in type. One of the interesting things, I think, is the extent to which your free will would be compromised in such a situation. I do believe in a “natural law” that can be logically drawn, but I also know that, in a situation where my life, family, and property were in danger, my first priority is to protect them, not to sit around and discuss the deeper philosophical ideals surrounding my decision. I wouldn’t even have to think about it– the zombies, the supersonic jerkoffs, and the rampaging masses would all be dead meat before they could blink. I could sit around and beat myself up about stealing that bushel of wheat or killing that person . . . after I had time to do more than react in hunger and fear. True. it’s easy to speculate when we are all well fed and content, but when you haven’t eaten for three days and you don’t know where your next meal is coming from, your perspective changes. Romero’s Dawn of the Dead from ’78 is probably the best zombie film of them all when it comes to exploring the issues you talked about and I discussed in the post above. You’ve successfully interested me in a genre I can’t claim to love or know much about. However, I must confess that Shaun of the Dead = genius. Love Shaun of the Dead. I could go on and on about the Zombie genre, but I’d rather spend that time watching Zombie Holocaust again. Eric — clearly LinkedIn is good for something, because it led me to discover that you’re blogging! You’re exactly as awesome as I remember. Let’s catch up. Sweet Jesus. How are you? Where are you? I’ll try to send you a message through linked-in.